Today, I was running a few errands before I had to go to work. I hadn't noticed that the flowers are really blooming beautifully here in Fort Myers and the weather was cool and people seemed to be happy today until after my encounter. I finished my shopping and walked into the parking lot. 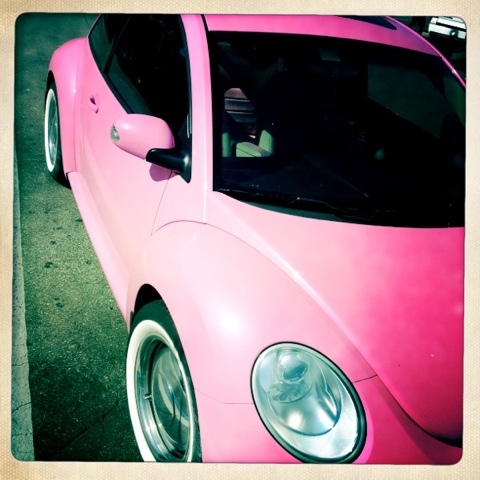 I saw this beautiful pink Volkswagen and as sickeningly pink as it was, it put a definite lift in my mood. It really pleased me to know someone felt good enough and happy enough to drive around in this screaming pink bag every day. No matter what their mood was, no matter how they felt, no matter if they were sick or well, they were driving around in this jewel. That takes confidence and it made me feel happy for that person. I had to leave to make an appointment so I didn't get to stick around to find out who drove it. But, whoever it is I bet their little world is alright. Art is life. Fall for the Arts at the Alliance!